EVERY DREAM IS UNIQUE AND SO IS EVERY PROPERTY. 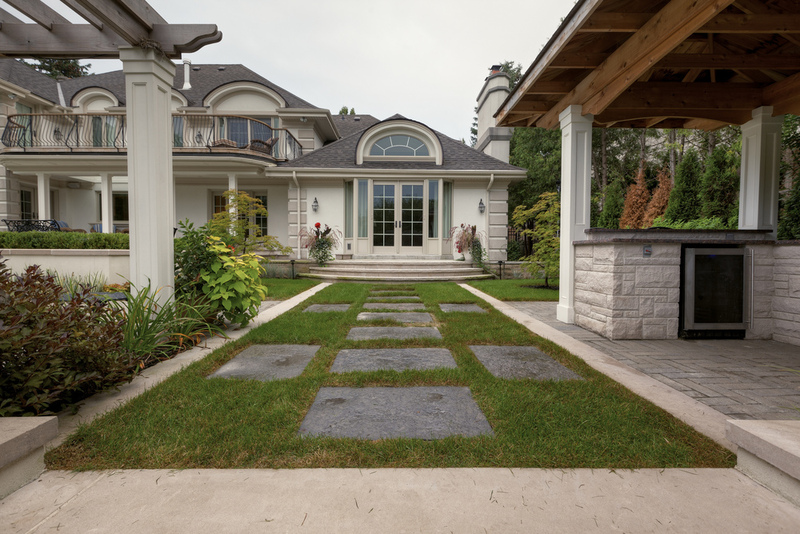 There are many factors to consider throughout the landscape design phase. Listening to homeowner’s wants and needs, assessing the existing site conditions and surroundings, architecture of the home, and the client’s budget, are all important factors that need to be considered in the development of each landscape design. This spectacular home had tremendous potential but was lacking tender loving care. The existing pool was run down. Surrounding gardens and lawn were over grown and unsightly. Patio paving stones were out dated and falling apart. The existing concrete walls, steps and pillars showed signs of deterioration. These homeowners were ready to give their property a well deserved makeover. Their needs included multi-functional entertainment, relaxation and lounging spaces. The pool waterline tiles were removed and pool was renovated with new marbelite. The existing coping was removed and replaced with Indiana bullnosed natural stone. New concrete walls, steps and upper terrace were formed, poured and veneered with natural stone. 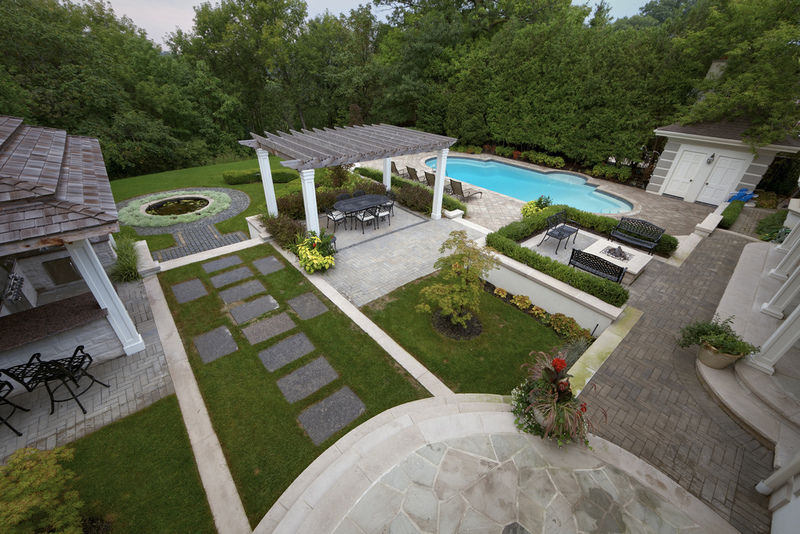 The old pool decking and lounging areas were replaced with square precast pavers, laid on a diagonal pattern, as well as herringbone pattern walkways. Two backyard structures were constructed to compliment the architecture of the home. 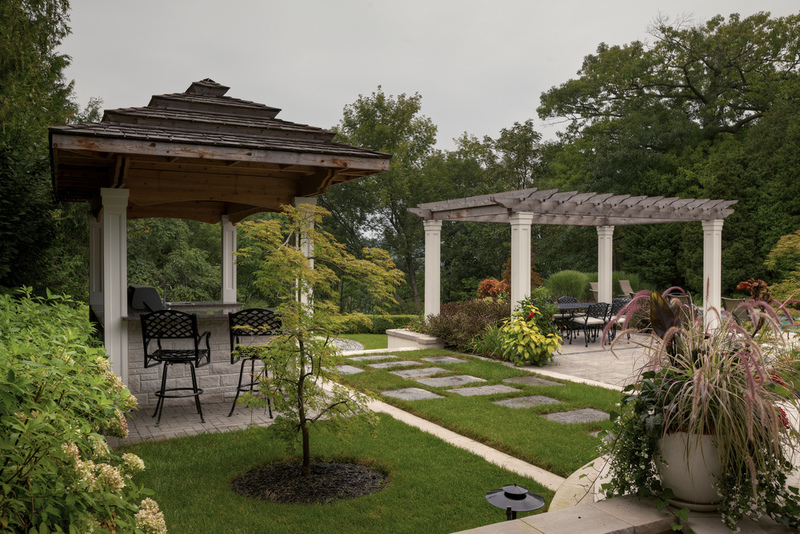 An open sided pavilion, complete with barbeque stone surround, fridge, sink and granite countertop provided the homeowners with a place for outdoor grilling. A secondary custom built pergola was steps away, creating a separate dining area. We also provided the homeowner’s another option where they can also sit back and relax around a cozy open gas fire pit. The once un-manicured gardens were transformed to compliment this formal, elegant and elaborate landscape.